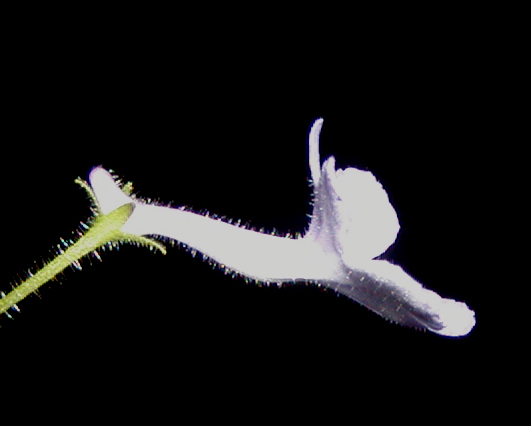 In this side view of the flower, note the spur projecting to the left from the base of the corolla (flower tube) past the upper lobe of the calyx. This is one of the features that distinguishes Sinningia pusilla from the other two miniature species, S. concinna and (especially) S. muscicola ("Rio das Pedras"). A comparison table shows that and more differences. This plant I inherited from the late Fred Stryker of San Jose, California, a great grower of the miniature sinningia species. 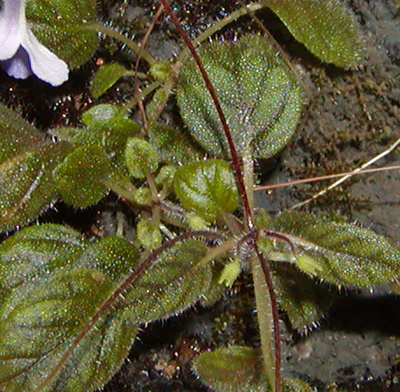 The plant forms a rosette with very short internodes and flowerstalks arising from the leaf axils. The leaves are spearpoint-shaped when young and heart-shaped when mature. The veins are slightly indented on the upper surface of the leaf. This combination of leaf features also helps to distinguish this species from the other two miniatures, especially when not in bloom. This is a pure white-flowered form of the species. The flower in the picture at the left has six petals (corolla lobes). Instead of the usual sinningia-flower (and gesneriad-flower) arrangement of corolla lobes with two upward, two lateral, and one downward, this flower has its lobes arranged two up, two lateral, and two downward. Such developmental quirks are not uncommon in sinningia flowers. It is not a special characteristic of this plant, which normally has the standard five-lobed corolla. Note the spur or bulge at the base of the corolla tube, which is a diagnostic feature for this species (Sinningia pusilla). This information was posted by Dave Zaitlin on Gesneriphiles. The location where Sinningia pusilla was originally collected is not known. The "Itaoca" and "Imbe" forms were found by Mauro Peixoto and colleagues, in Rio de Janeiro state. The "Imbe" form was collected in 2013. Dormancy Usually not dormant. Reseeds easily. Taxonomic group The aghensis group of the Corytholoma clade. 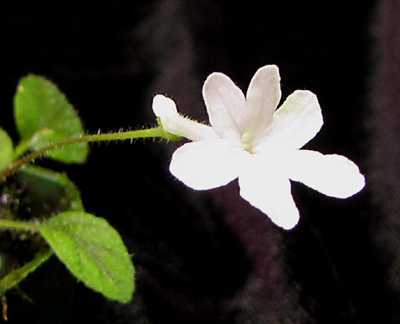 The Gesneriad Society web site has a picture of a plant grown by Dale Martens. Sinningia pusilla was first published (as Tapina pusilla) in 1829 by Carl Friedrich Phillip von Martius (1794-1868). It was published as a sinningia in 1888 by Henri Ernest Baillon (1827-1895). Etymology: Latin pusilla ("small", usually in a pejorative sense, cf. English "pusillanimous"). Ultimately from same Indo-European root (pau) as English words few, poor.